Fuelled by dark pacts with forbidden powers, the Nazi cult of the Black Sun are unleashing unspeakable Cthuhu Mythos horrors upon the Allied forces during World War Two. As the brave Allied heroes of Section M and Majestic clash with fiendish Nazi villains, forbidden weapons, esoteric sorcery and powerful Mythos allies are brought to bear in the struggle to prevail. Command your foes across the battlefields of the Secret War from vast secret bunkers, to ancient ruins or the chaos of the front lines. Now is your chance to unleash the power of the Black Sun or make a last stand as the heroes of Section M and Majestic. 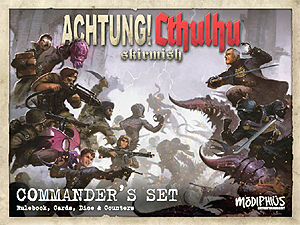 The official skirmish miniatures wargame of the award-winning Achtung! Cthulhu roleplaying game. Based on Spartan Games' Dystopian Legions 2.0 core rules.